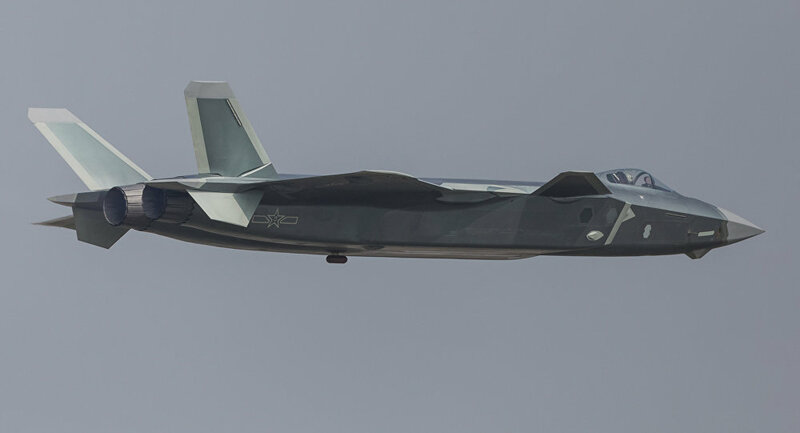 Beijing’s fifth-generation stealth fighter participated in a variety of aerial maneuvers and simulated dogfights at an air show in China Tuesday. Thrust-vectoring engines that are seen as key for aerial superiority were showcased on the advanced J-20 and the J-10B, a trainer aircraft, during the annual air show held in the southern Chinese city of Zhuhai, Asia Times reported Wednesday. At least three People's Liberation Army J-20s and several J-10Bs were powered by these engines at the show, according to Asia Times. The J-20 sported a new aesthetic in celebration of the PLA Air Force's 69th birthday, a Chinese military spokesman confirmed to Sputnik last week. The J-20 conducted its maiden flight as China's first fifth-generation stealth fighter aircraft two years ago at the same air show in Zhuhai. The jet means China has an aircraft with technical specifications roughly comparable to Russia's Su-57 and the US' F-22 and beleaguered F-35. The show was an opportunity for the PLA-Air Force to showcase the WS-10 Taihang, the indigenously produced turbofan engine that powers the J-20 and J-10. Sputnik News reported November 3 that China's GJ-2 unmanned aerial vehicle was slated to take to the skies during the air exhibition, which runs from November 6 to 11.